I was inspired to make spooooooky evil characters for you to use in your games. Enjoy these vampires. Male and female vampires, with emotions and spooky bat form. And a fun transform animation! This sheet is arranged to be used in RMVX/Ace, but it’s free to use in any program/engine/whatever. It’s compatible with everything in the Time Fantasy style. 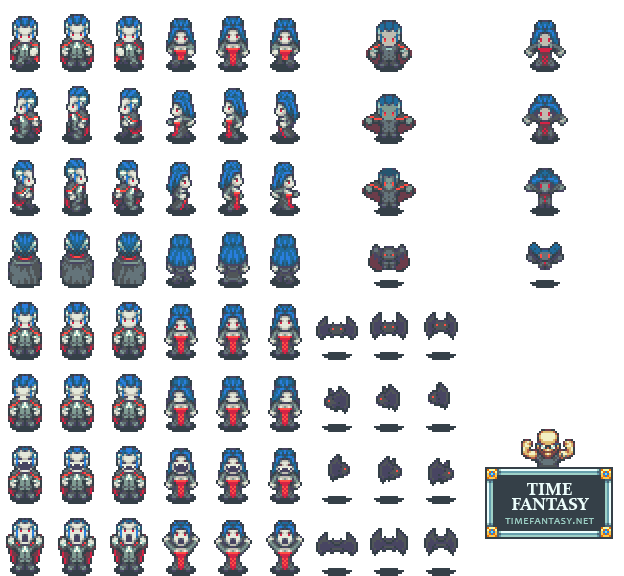 Are these sprite sheets released under a specific license? I ask because I am looking for sprites that are compatible with a GPL licensed game project that I am part of. From the sound of the description, many of these sprites could be licensed under CC0/Public domain? I just need to make sure that I don’t add any artwork to the game that isn’t compatible with the GPL. For my free bonus releases like this, no specific license but no real restrictions either. So yes, that is fine.